This is the time of year when NBA teams conduct their midseason draft review. What is a midseason review, and what's the right approach to take when evaluating prospects in January? I was of two minds about the office setup at the Trail Blazers’ practice facility. The top executives and head coach had their own offices, but everyone else sat in one of a cluster of cubicles, which could be frustrating when trying to get work done. It was hard to concentrate, and easy to get sucked into conversations that ate up a lot of time. On the other hand, the ease with which you could duck into a co-worker’s cubicle made it a great environment to learn from others and share ideas. Which is exactly what happened one day in the winter of 2012. I was lucky enough to have the cubicle next to Joe Cronin. Joe had worked his way up from an intern, and now was both a self-taught salary cap maven and scout.1 I learned an incredible amount from him over my years in Portland, and it didn’t take me long to realize that when he wanted to show me something I should drop what I was doing and walk around the cubicle divider to his desk. Joe had film of a Syracuse game pulled up on his computer. He pointed to a guard on the screen and hit play on the keyboard. The guard got the ball in transition, took a dribble at a normal speed and then all of the sudden hit another gear. Joe flipped to the next clip. The guard had the ball at the top of the key, turned the corner, and separated from his man like he had a jetpack on his back. I pulled up Waiters’ page in our statistical database and glanced at his advanced metrics. “Interesting.” Joe scribbled down some notes. Thanks.” I went back to work, and didn’t think about the conversation much more until a few days later. The front office was gathered in the conference room for our midseason draft review, discussing our internal rankings of various draft prospects. “Anyone else you think needs to move into a different tier?” asked Chad Buchanan, our General Manager. Perhaps now, looking back, that doesn’t seem like such a bold statement. But at the time it was fairly radical. To get a sense of what people thought of Waiters, in early January of 2012 he was ranked 42nd in Draft Express’ top 100 prospects, and NBADraft.net did not even have him in their 2012 mock draft (they had him pegged to stay in college another season). Joe’s comment, of course, would prove prescient. 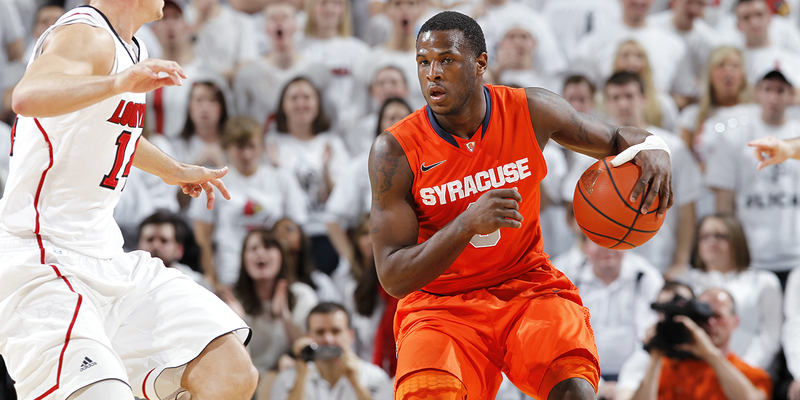 By the end of the college season, Waiters was ranked 21st on Draft Express, 26th on NBADraft.net. By early June, Waiters was ranked 11th and 13th on those sites, respectively, and had canceled his remaining pre-draft workouts due to the Phoenix Suns’ (rumored) promise that they’d select him 13th if he was available. On draft night, the Cavaliers selected Waiters 4th overall. Clearly we weren’t the only team that saw the need to study Waiters more. When we tell stories of important decisions, we often make them about the individual: about the blundering fool who drafted the bust, or the scouting genius who saw something nobody else could. And sure, that’s a fun way to tell a story. But it’s not accurate. Decisions are shaped by a process. Walk into the draft room on the last Thursday in June with no preparation, and you might as well be picking names from a hat.2 Process is what gets you there, what pushes the odds for or against you. When Steph Curry makes a layup, it’s mostly a result not of anything that happened in that moment, but of thousands of hours of dribbling, shooting, and finishing drills. That’s process. Similarly, when a GM makes a draft pick, it’s mostly not a result of what they are feeling in their gut. It’s why they are feeling that — the process that got them to that point. Repeated good decisions don’t just happen. They come from process. As a basic example, who do you trust to get more draft decisions right: the scout who only watched the NCAA Tournament from their couch, or the scout who spent the entire year studying film, attending games, discussing players with coaches, and thinking deeply about what skills translate to the NBA? Teams have taken that second method and systematized it — they have made all of those actions a part of their draft process. They don’t just show up on draft night with preferences based on what they saw while shoveling chips and rooting for upsets with their friends. They have spent at least a year, and usually multiple years, following a process to gather important information: watching players in high school events, attending their college practices, even hiring private investigators. That information, properly digested, can then help them make better decisions. One key part of that process is happening at this time of year in front offices around the league: the midseason review. A midseason review is simply a time for teams to gather all of their scouts and executives and get a pulse on the draft. It happens around the start of conference play in college, when scouts have seen enough to have a decent sense of who players are, but still have plenty of season left to study them in much more detail. Executives who haven’t paid as much attention to the draft to this point can use it as a time to catch up and get a sense of the draft class, while scouts who have been bouncing from city to city can take a step back, gather their thoughts, and participate in structured discussion with the rest of the organization about these prospects. For the organization, the midseason review has two main benefits. First, it lets executives get a sense of how to value draft picks in deals that will be discussed at the upcoming trade deadline. If the draft class seems unusually deep, that might make a team more likely to try to acquire or to hold onto a late first round pick. Or if there are multiple players they like at the top of the draft, a team might think more about making a major deal for a pick that could fall in that range. Second, it allows a front office to think carefully about the remainder of the scouting season. Who are the players we need to know more about? How should we schedule travel and film for the next few months? What are the specific questions we have about players that we need to dig into more? This is how we, in Portland, benefited from the midseason review in 2012. Maybe we would have come around to studying Dion Waiters in more depth anyway, but a structured process like a midseason review makes it much more likely. And, as a result, we were prepared. We had seen him live and watched him on film and gathered background information on him early enough that when Waiters pulled out of the Draft Combine and canceled his workouts, it didn’t surprise us or leave us in a bind. But process for process’ sake isn’t worth much. It’s not just about preparation, but proper preparation. Because there’s a danger to a midseason review as well. Come to an opinion too soon on a player, and it’s easy to get anchored to that belief. Especially if you’ve made a declaration about him in front of the entire scouting staff. And when everyone comes together to discuss their opinions on players, it’s a situation that is ripe for groupthink. What’s needed is not only a midseason review, but a midseason mindset. The entire point of the midseason review is that it comes early enough in the season that there’s plenty of time to learn more and adjust. No decisions have to be made anywhere close to that point. So let’s lean into that. Think clearly from the ground up. Understand and explain from first principles. Ignore society and politics. Acknowledge what you have. Control your emotions. The midseason mindset, of course, isn’t one that is valuable solely in a midseason review. It’s valuable in many areas of decision making, both within the basketball world and without. Because as much as it makes a good story to believe in great gut-decision-makers and scouting savants, that’s not reality. Decisions come from process. Want to improve your decisions? Improve your process. Over the coming weeks I’ll be conducting my own version of a midseason review on Cleaning the Glass. For Insider subscribers, I’ll be going through some of the top prospects and writing up my thoughts based on watching some games on film and studying their stats, aiming to reflect these values: identifying my early impressions without anchoring, remaining open-minded, and asking a lot of questions. I’ll be doing my best to maintain the midseason mindset.